This is a regular blog post. Be sure to check out the other posts, many of which contain show notes and links to show audio and video. I spent yesterday at the first show day of the Vectren Dayton Airshow. Probably the largest show I’ll hit this year other than Oshkosh. Really well laid out and very nice facilities for media. I’m grateful to the organizers for the access that made this a great first experience at Dayton. As usual, I get pulled in many different directions at these things. In the best way. To a large extent, what I see from the crowd line has more to do with what other opportunities I’m covering on the field. It might take five or six shows before I get to see all of the performers that performed at any given show site. But that’s okay. 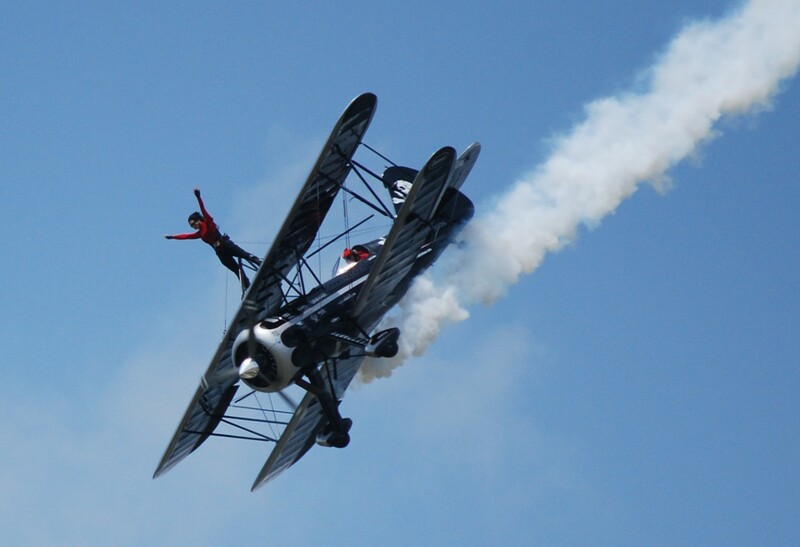 This was my first time seeing Kyle and Amanda Franklin’s wing walking act. I’ve said before that I’m not so into wing-walking. I appreciate the difficulty and skill, but – as always – my thing is chasing things that I’d like to do. I’d love to go fly that beautiful Waco JMF-7 Mystery Ship. But firmly strapped into the cockpit and cranking it around a bit. And there’s beauty in that solitary figure on top of the wing challenging the wind blast. I know it’s a team (somebody has to fly the airplane), but the image that gets me is the strange combination of vulnerability and strength in that image. I rarely blow up images that I take at airshows and hang them up in my office. But one of the images for which I’ve done that is a shot of Theresa Stokes atop Gene Soucy’s Show Cat from Selfridge three years ago. It’s really dramatic in a way that doesn’t happen with other acts. Maybe it’s that you can see the performer from head to toe. The performer is not the airplane, as is the case with the other aerobatic acts. Maybe that’s why I like Greg Koontz’s act so much. In the Clem Cleaver act, you get to see Greg out there with the airplane and he flies low with the door off, so you actually get a sense of the man as well as the machine. Anyway, above is the best of the images of Kyle and Amanda that I was able to capture. I’m not the guy with the long lens (I shoot with a Costco special from Nikon that came with a reasonably capable 200mm zoom), so there’s a fair amount of cropping involved, but I’m pleased with this one. And it evokes that vulnerable, yet defiant thing. 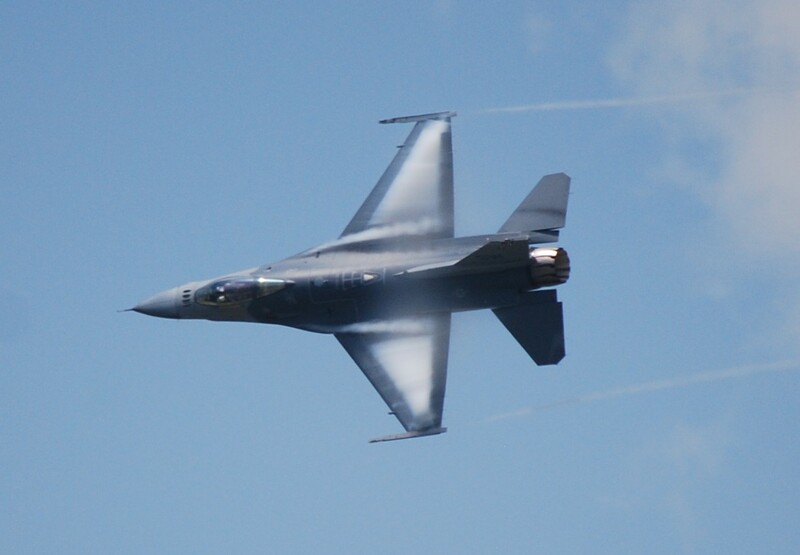 Capt Ryan Corrigan of the Viper East Demo Team put the F-16 through its paces. Really nice display. And the humidity was just about right so that it wasn’t too hazy to shoot, yet the aircraft created excellent vapor on the wings when pulling Gs (which was most of the time). The show hosted two B-17s. 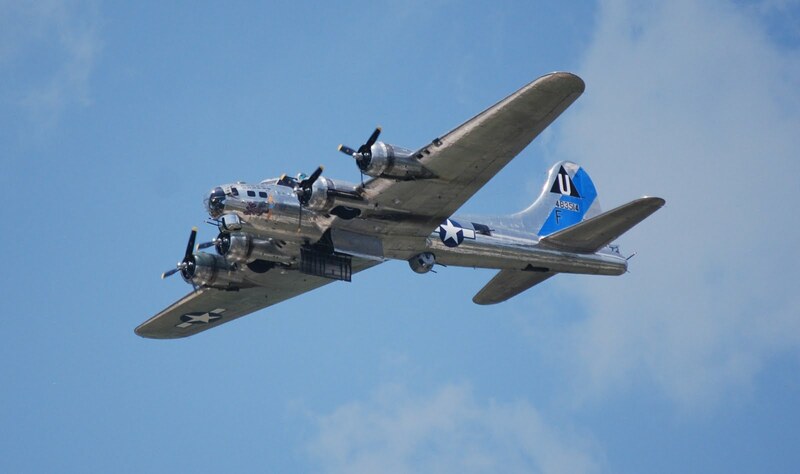 This is the Commemorative Air Force’s B-17F, Sentimental Journey. She has been everything from a bomber in the Pacific theatre to a photo reconnaissance platform to a fire fighting platform. The CAF Arizona Wing acquired the aircraft in 1979 and has been operating it since then. What’s better than a C-130? 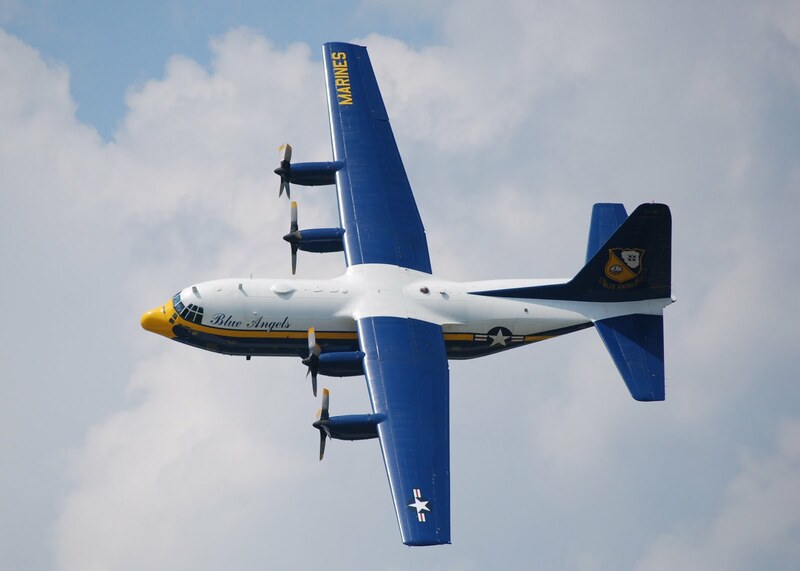 An aerobatic C-130 flown by steely-eyed and slightly crazy Marines. The days of JATO launches are over, but I can’t seem to get bothered by that. It’s just stinking majestic to see this bird fly and be as nimble as it is, notwithstanding its 76,000-lb (empty) weight. Plus, a Fat Albert pass is an opportunity for us guys with the shorter lenses to actually get a better shot than the long-lensed shooters. Although I was kind of jealous of one guy who actually got the face of the rider up in the dome on top of the aircraft. This is also the first time in years that I was close enough to the Blues to be able to see them step. In a very real sense, the demo begins a good 15 minutes prior to takeoff. They do the precision step even though 99% of the crowd can’t see it, and even when they stage across the field and almost no one can see it. 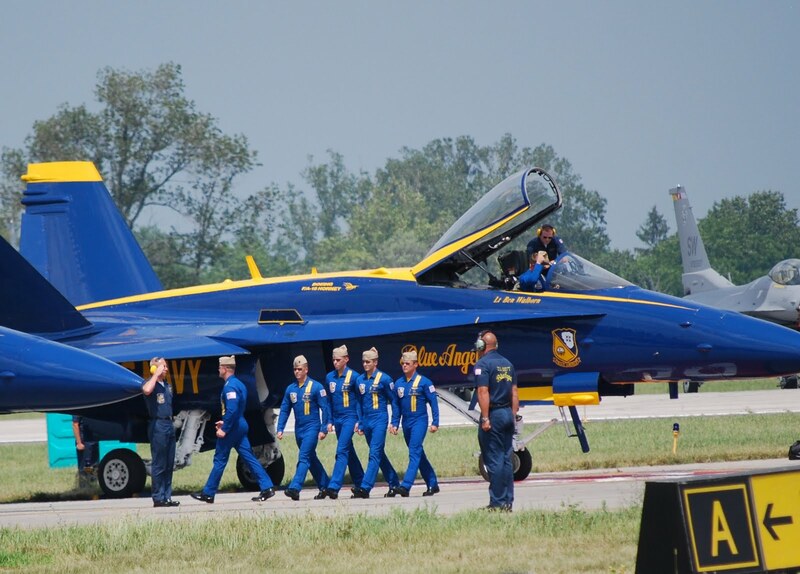 I often talk about stomping the ramp or doing the Haka prior to a flight. The Haka part is mainly in jest. (But only mainly.) But a preflight routine of almost any kind focuses you and serves as the thing that separates two-dimensional activities from the impending three-dimensional activities. And that’s a good thing. You’re about to go do something completely divergent from what our species is used to. You’re about to go and fly on behalf of those homo sapiens who lived during the 200,000 years prior to aviation. It’s serious business and it sends a chill up my spine every time. Maybe the Haka isn’t such a bad idea. Say on the ramp at KBAK for NESA MAS next year? 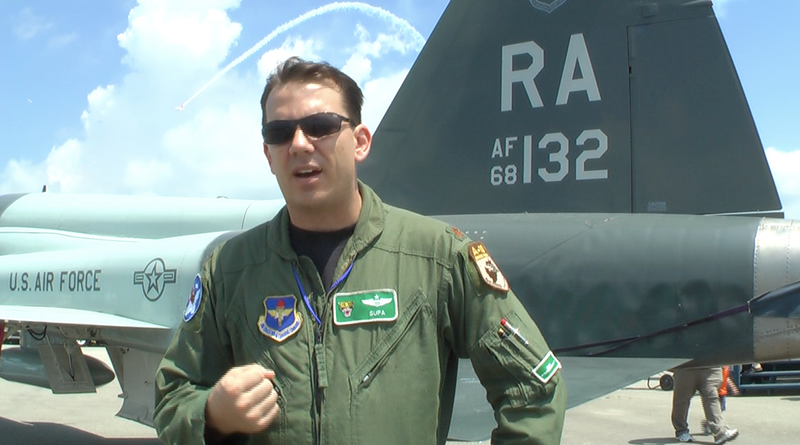 I also interviewed Maj Luke “Supa” Fricke, a T-38 IP from the 560th Flying Training Sqn, 12th Flying Training Wing at Randolph AFB near San Antonio, Texas. He’s an IP in the T-38C who makes other IPs for a living. He started out in the T-37 Tweet and then moved to the T-38 for advanced training. He then did a stint as a T-38 first-assignment instructor pilot (“FAIP”) before going on to fly the A-10 Thunderbolt II (the iconic “Warthog”) for 13 years before heading to Randolph to train instructors in the T-38C. I’m going to use the footage to supplement the T-38 ride footage from the Beale AFB flight last week. We weren’t able to do a planeside interview at Beale because of the amount of noise on the ramp (not a bad thing, mind you – I adore that kind of noise). So the planeside footage of Maj Fricke will go nicely with the episode. I also got some beauty shots of the airframe to drop into the episode at strategic moments. Maj Fricke did a great job in the interview. He was nearly perfect at working each question into his answer so none of my voice had to be in the interview. He also did a great job of stopping and restarting at logical points when the AeroShell T-6s drowned him out momentarily. (Note the T-6 smoke arc behind him in this frame grab, which was unplanned but kind of cool.) I’m guessing that he’s done this before. I hope his PAO knows what a great ambassador he or she has in Supa. So now it’s back to the grindstone for a week and a half until Oshkosh. I’m planning to leave southeast Michigan at oh-dark-thirty the morning of Wednesday 28 July and hit the American Champion factory on the way to OSH. FOD and I should make it there late afternoon and then be on the grounds through Saturday mid-day. I’ll tweet the lat-long for Firebase Airspeed as soon as we get settled in. See you there!